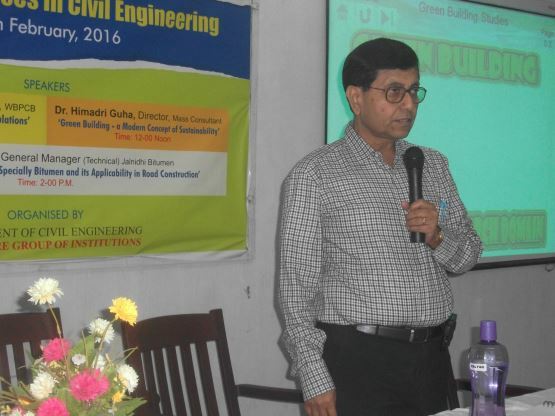 A one day seminar will be held on the 11th of February, 2016 on 'Recent Advances in Civil Engineering'. It will be organized by the Department of Civil Engineering, SDET- Brainware Group of Institutions, Barasat Campus. The speakers will be Dr. Tapas Gupta, Chief Engineer, WBPCB. He will be speaking on ‘Green Building and Environmental Regulations’. Time: 10-20 A.M. The second speaker is Dr. HimadriGuha, Director, Mass Consultant. His topic of discussion would be ‘Green Building - a Modern Concept of Sustainability’. Dr S.K. Mukherjee General Manage(Technical) Jalnidhi Bitumen will conduct the last session of the Seminar. The subject being ‘Recent Developments in Material Specially Bitumen and its Applicability in Road Construction’. The talk will commence at 2-00 P.M.